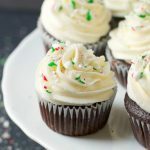 A delicious mint chocolate cupcake topped with a fluffy peppermint buttercream frosting and crushed peppermint candies! Perfect for the holidays, or anytime! Preheat your oven to 350 degrees Fahrenheit. Add 12 paper liners to a 12-cup muffin or cupcake tin and set it aside. Add the sugar, cocoa powder, flour, baking soda, baking powder and salt to a large bowl and whisk to combine. Add the milk, the egg, the canola oil and the peppermint extract to a medium-sized bowl and whisk with a fork to combine and break up the egg. Add the wet ingredients to the dry ingredients and whisk everything together just until all the ingredients are combined. Add the boiling water to the mixture in a slow stead stream, whisking constantly until the boiling water is incorporated. You'll be left with very runny cupcake batter which can be poured into your prepared cupcake tin. Be sure to distribute the batter as evenly as possible between the 12 cupcake liners. Bake the cupcakes at 350 degrees Fahrenheit for about 22 minutes or until a toothpick inserted into the center of one of the cupcakes comes out clean. Cool them on a wire cooling rack. For the frosting, beat the room temperature butter on high speed until it's pale in colour and completely smooth. Add the powdered sugar one cup at a time, beating on low speed until all the powdered sugar is incorporated. Add the peppermint extract and the milk (or cream), one tablespoon at a time until the frosting reaches piping consistency, beating well on medium high speed after each addition. Add the frosting to a piping bag fitted with a large star tip and frost each of the cupcakes after they've cooled, creating a swirl design and topping each one with some crushed candy canes or peppermint candies!